From the inception of Share International magazine, Benjamin Creme’s Master provided articles to be published not only at the time they were written, but also whenever appropriate according to world circumstances. Indeed, many of these articles seem more relevant now than when they were first published. Seldom in the world’s history has there been a time like the present, a time of such convulsive change and promise for man. Once again, in the turning of the Great Wheel, man is about to discover a new meaning and purpose behind the outer manifestations of his life, and to renew contact with the source of all his wisdom and inspiration. After long and due preparation, the ancient Body of Knowers, the Spiritual Hierarchy, is returning to the world of men, ready to implant there the seeds of knowledge and truth which will take men to the heights from which the Gods smile down. In the immediate time ahead, men will come to know the Masters of Wisdom as their friends and allies on the long path of evolution, as their guides and mentors in an expanding awareness of the Plan They serve, and as their guarantee of future, and like achievement. At the present time, the Masters are gathering Their forces for the onslaught on tyranny and greed, exploitation and want. They know that not all men are ready for the changes which must ensue but they know, too, that most men, by far, desire a new dimension of life, and are ready for the deeds and sacrifices which will bring it into being. They will not be slow to respond to the counsel of the Great Ones. Make ready to see Them and to answer Their call. Make ready to act and to aid Them in Their task. Make ready, too, for the stream of new light, new life and new knowledge which will flow from Them into the world. Thus will all be changed. Thus will the old be swept away and a new era begin. Thus will the Teachers revitalize men’s lives and create the conditions for the emergence of a new man. The new man will demonstrate his allegiance to the truth that humanity is One, held together by the force of Love Itself; by his tolerance and harmlessness, his correct relation to all the kingdoms. The new man will be known by his capacity for right action, intuitively understood; by his ability to interpret rightly the Will of God. Thus will gradually emerge the God Who sits within the heart of all men, potential, waiting to be called into manifestation by the actions of man himself. The key to this development lies in a growing working relationship between the Masters and men. From this will grow a bond so deep that naught can sever it, creating thus a channel for the gifts of wisdom, love and knowledge which are the Masters’ to bestow. Their divinity will call forth the divine in man, and men will discover they have been, forever, Gods. All of this will not happen in a day, but slowly and surely the divine in men will respond to the fire of divine love and wisdom which radiates from the Masters. They will gather round that fire and find among the flames the reflection of their future. So will it be, for so it has been decreed by the Lord of Life Himself. Shortly, now, the Masters will be seen and known for what They are – the Guides and Teachers of the race of men, the Elder Brothers of humanity, the Knowers in whose hands lies the destiny of the world. Welcome Them into your midst and be prepared to serve with Them. Be generous with your offering of service and become Their co-workers. Know that They know the Way and will take you with Them to the Gates of Freedom. BC: What is a planet? A great sphere in space related to other planets in its system with the sun as the nucleus of them all. But why the life on them? Why do we come into incarnation? Why are we on this planet and not somewhere else? Or why at all? There has to be a reason why this planet is teeming with life. All forms of life: human, animal, plant and mineral life. They are all part of one whole. Each grows out of the other. We imagine we are the top point of evolution but from the human kingdom grows a further kingdom – the spiritual kingdom or the kingdom of souls. And most of humanity doesn’t even know the true constitution of man. If they believe in Darwin’s theories they believe we are intelligent animals, developed from animals; we branched off, they believe, and developed a mind, clever enough to create a technology which can build rockets to take us to the moon and so on. This theory is acceptable as far as it goes but it misses the point – that we are part of another kingdom. It is the growth of the spiritual kingdom out of the human kingdom that completes the kingdoms (and the evolutionary process) on this planet. Life proceeds according to a plan. The solar system is a sentient living body, which is the body of expression of a great Cosmic Being. I can’t call Him a man or a woman or someone we would recognize but a great Being Whose plan is the eventual perfection of planet Earth – and every other planet for that matter. We are here according to a plan. Not just a plan for our planet but a plan bigger than ourselves. We take part in the evolution of planet Earth according to plan, the plan in the mind of that great Cosmic Being Who ensouls planet Earth. It follows that if there is a plan there must be exponents of that plan. These exponents are those members of humanity who have evolved according to the plan, in the light of the plan, becoming more and more what they essentially are, that is, souls in incarnation. Every man, woman and child on Earth is a soul, a living, growing, evolving soul which is the reflection on the soul plane of an even higher (if one can speak of ‘higher’) but more all-embracing entity which is the spark of God – the divine spark. That divine spark is far in evolution, and therefore in vibration, from us on the physical plane. We are souls in incarnation, reflecting our true selves, our divinity through the human personality with a physical, emotional and mental body. Most people consider themselves to be that personality only with these three bodies of expression, whereas in total we are all a spark of the divine, perfect in every aspect of divinity at the level of our own planet…..
Q. How many governments or heads of state know about Maitreya? A. It is difficult to say. None of them know Him personally. Some have heard of Him but probably did not believe what they heard. So the answer is probably: nearly none. However, in many countries there are disciples of the Masters working in diplomacy. Every government has such a diplomatic corps, a department whose staff deals with other countries to try to resolve problems. Ambassadors are part of that group. Some members of the diplomatic corps representing the various countries are disciples of the Masters. Not only do the Masters have disciples working in the diplomatic corps but the Space Brothers, too, have their contacts, their people working within the diplomatic service in various countries. Q. About the Blessing which happens at the beginning and end of your lectures, would that be ‘strong’ enough to reach, say 3,000 people or more? A. There is no limit! On 4 June 2018 I had an unusual encounter on my way to Berlin by train. Somehow that day I knew to expect something might occur. Some months before, in November, I had prayed for guidance from Maitreya, as I was struggling to come to terms with living abroad and feeling unclear about how to best serve in a place where I often feel isolated. I boarded the train and noted a four-seater – two sets of seats facing each other that seemed empty. When I got closer, I noted that the two seats next to the window were layered with old cardigan sweaters, which covered rows of plastic bags between the seats. This was strange, as generally no one ever leaves their things unattended on German trains. The bags were themselves layered – three or four layers, one inside of the other – and I assumed they contained personal belongings. I sat down in one of the aisle seats, curious about who might claim them. As the train started, I glanced at my phone and saw a photo of my daughter’s best friend, Ursula, posted on Facebook by her mother. Looking out the window at one of the train stops I noted a large building, a machine company with the name, “Schlueter” in big letters on the side and wondered if the owner was related to another machinist I know by the same name. About 10 minutes before the last stop, an elderly woman with a sweet face came up from the aisle behind me and stood next to my seat. She reminded me of the British actress Judi Dench (except that her teeth were badly broken and half missing). She was dressed head to foot in layers of sweaters, with a pink sweater-dress on top, and she wore a jaunty pink knitted beret on her head. It was a warm day so her dress surprised me. But most surprising were her bare feet. It was clear that she was not in the habit of wearing shoes and her feet looked worn and dirty. She moved her things so that I could sit next to the window and she took the seat beside me. As we spoke, she realized I was not a native German speaker, and asked what language I spoke, then easily switched to English. She explained that she had been traveling for five years on local German trains to see the real towns and villages in the region. She said, “One can’t really see anything of the world or travel, when one has the responsibility of a house and things to look after.” I felt this spoke directly to my own challenges. I thought of my own attachments and preoccupations with home and material possessions that hinder my commitment to be a more conscious server, freer to move about or make time to share a message of hope with a broader audience. She mentioned too that she had originally carried luggage, but that it had been stolen or vandalized, suggesting that she had experienced less than accepting attitudes regarding her lifestyle from the public or fellow travelers on the trains. But she appeared unfazed by such experiences. She gave no indication that she identified as ‘homeless’, rather her attitude suggested that her lifestyle was a conscious choice and that she was detached about what people might think. When out of concern I enquired about her shoeless feet, she replied that when she had worn shoes, years before, they had caused her blisters. She said she had discovered that if one is covered from head to ankle in wool clothing, one would stay warm, even if barefoot in wintertime. As we readied to disembark from the train, I thought to ask her name. I was taken aback by her response, as it seemed to come from my own thoughts: she said her name was “Ursula Schlueter”. The encounter left me very inspired, with the reminder that in the end we all make choices in our lives and that I myself must create the conditions that free me to better serve. It recalls for me Benjamin Creme’s advice that as a disciple, one belongs to the world. A new photo exhibition opened on 12 August in the Share Nederland/Share International Information Centre in Amsterdam. It was a successful day, attended by both public and group members. Among the visitors was a man of Surinamese origin whose energy and words were impressive enough to prompt us to include them in this issue although the letter has only just reached us late in the production stage. He spoke at length with a number of the co-workers. The following is a brief summary of some of the most important points he made, remarks which we consider of value to co-workers around the world and in America in particular. The full letter will be published in the October issue. He knew all about Maitreya, he said. He was particularly interested in America and spoke about the negative impact of market forces and commercialization. He knew the financial scene in London, too, and explained how through huge bonuses and salaries employees get tied into the system and are afraid of losing their jobs if they criticize. It’s all about money and never about the people. Our visitor said that war is, above all, profitable for the weapons industry. He also warned about President Trump and how, while the public and the media are distracted by his constant tweets, Trump is busy signing the most appalling laws which leads to workers losing their rights. Share Nederland group members, The Netherlands. I had an eye operation in May (2018). I wasn’t looking forward to it and had asked for help via the ‘Hand’ of Maitreya. After the operation on one eye, my husband and I were waiting for the elevator, when a man came and stood beside us. Then he took my hand, and asked with a concerned look, “Are you alright?” I was so overwhelmed by the operation and everything about this special man that it occurred to me only later that it had been an extraordinary encounter. My other eye has been operated on since then and I am very grateful that my eyesight is alright again. A familiar figure entered a minute or two late to join us in the Information Centre for a Transmission Meditation workshop on 24 June 2018. We know him to be “Maitreya-in-that-guise” who often visits. This time he stayed for the whole workshop and for some time afterwards. During the workshop he made the point that ‘Focus is the most essential element in Transmission Meditation in order to maintain alignment’. After the workshop he stood looking at Unity in Diversity (one of Benjamin Creme’s books), as he has done on one or two previous occasions. One of the co-workers spoke to him and remarked that not many people attend workshops and lectures. He said that this information is still not accessible enough to a lot of people. We interpret this to mean we ought to make our information more broadly accessible. He remarked that young people are preoccupied with their own interests and added “if we were advertising a pop concert people would come”. But, he said, “in the future people will be pouring in”. He was asked about something he had said during a previous visit about not having to wait too much longer. “This year..., next year...,” he said, and then added something like “time is different there”. “We need to have faith and wait patiently, all will be well.” He repeated this a few times throughout the conversation. We had recently been wondering how we could possibly expand the space in the Centre, perhaps build an extension; he indicated lightly “Pity about the garden!” The advice being: that the extension wouldn’t be necessary; he assured us that “it will resolve itself”. He talked about the “importance of speaking out if one sees something wrong. He said he “cannot keep quiet when it is necessary to say something if you see something wrong.” This seemed really important. He said he is “looking forward to years in which he can do things that are important”. He talked about how little you need: “It is just things. One day you buy a chair and some months later you wonder why on earth you bought it, it is not even comfortable, and you get rid of it.” But, he advised one should not try to save money by not buying food: “I’m not going to economize on food.” This felt like a pointed remark to some in the groups. The recipe for good health: meditation, good food, sports and reading are important. He also gave some other advice about health – the need to take a holiday, to take rest, and various other personal matters. One of the group members was able to ask about possible future health issues and received reassurance. Service is always possible, even if one’s health isn’t good and “when one door closes, another always opens”. He also talked about depression or ‘burn-out’ and mentioned a period of 15 months in that connection. This seems to have been a relevant reference for a group member. He left with a copy of the book The Art of Living and also the July/August 2018 Share Nederland magazine and with a promise to visit more frequently, a promise he had also made previously to others in the group. Group members, Share Nederland Information Centre, Amsterdam, the Netherlands. An image resembling the face of Jesus appeared on a wall in the town of Thionville, France, in June 2018. The image, located on a barrier separating two residential properties, was first seen by resident Bernard Peter, who noticed it while looking out the window of his apartment. At first Peter expressed scepticism regarding the image’s possible miraculous origin, but his wife, who suffers from Parkinson’s disease, had a different response. “When I told her what I saw,” Peter told the French newspaper, Le Republican Lorrain, “she made the difficult walk to the window, and viewing the image, began to cry”. Please see Share International magazine for the complete versions from which the excerpts were taken. As summer temperatures climb to sweltering heights around much of the northern hemisphere, it won’t come as a surprise to many that 2018 is on track to be the fourth warmest year on record, surpassed only by 2015, 2016, and 2017. According to data from the US National Oceanic and Atmospheric Administration (NOAA), this period marks the warmest four-year span since measuring began, while June 2018 saw the 402nd consecutive month with temperatures above the 20th-century average, and in July, at least 118 all-time heat records were set or tied across the globe. Reminding us that up until today, the science warning us has relied on supercomputer models of the climate system to predict what will happen, McCarthy says such predictions come with inherent uncertainties, and it’s these which have enabled climate denial to “sprout and flourish”. He notes that the time has come when people are finally realizing beyond doubt that something abnormal is happening to the global climate, and this may be the start of a process that will “…eventually throw the perverted ideology of climate denial into the dustbin of history – where it belongs”. As temperatures soar around the planet, the challenges global warming creates are now being thrown into sharp focus, and the limits of basic infrastructure – much of which was built on the assumption of a cooler climate – are being tested: roadways are melting, railroad tracks bending, airport runways are cracking and power plants from France to Finland have had to power down because water from local waterways used to cool them became too warm. Where political will is failing to address the dire consequences of climate change, most inspiring of hope is that ordinary people around the world are taking up the challenge to turn the tide themselves. Concerted divestment campaigns are yielding results with over $6 trillion in assets already committed to divest from fossil fuels. As of July, more than 1,000 climate change cases have been filed against governments, corporations and individuals in 24 countries, and 888 of these cases are in the United States, according to Columbia University’s Sabin Center for Climate Change Law. A Call for Revolution was written by Sofia Stril-Rever from conversations with the Dalai Lama in July 2017; it was published in the same year in French as Faites la Revolution, and in English in 2018. The book followed Stril-Rever’s presentation of the Dalai Lama’s message to the United Nations Climate Change conference in Paris in 2015, on the need to take “universal responsibility for the earth’s ecosystem”, and subsequent seminars she organized with French lawyers on tackling climate change. The main themes of the book are the call to the young to act for change; the urgent imperative for humanity to accept responsibility for the ecosystem; and the Dalai Lama’s persistent “yearning” for world peace. He mentions his influences: neuroscience as an adjunct to his Buddhism, the French Revolution, and the European Union as a model for growing world unity. Above all, the sense of the oneness of all life underpins everything the Dalai Lama writes. So, the Dalai Lama calls for the “Mother of all Revolutions”, the “Revolution of Compassion”– both within the individual and in society as a whole – and he affirms his faith in the young of the 21st century to bring it about. A Call for Revolution is a short, small-format book, concisely and powerfully written. Addressed throughout to ‘the youth of today’, it is inspirational and full of hope. The best way to give the reader a flavour of this book is through a selection of quotations; these do not necessarily follow the order in which they appear in the book but are arranged according to relevant topic. “My dear young friends … I believe in you. “I have grown increasingly convinced that your generation has the capacity to transform the dawning century into an era of peace and dialogue. You have the means of reconciling our fractured humanity with itself and with the natural world.… You are the first generation of truly global citizens. “The problems that you face today were not created by you. My generation and that of your parents … are the problem generations. You must be the solution finding generation! “Make good use of collective intelligence, based on sharing. And above all be the generation that acts. “Everything that I write is for the purpose of explaining how to create the conditions necessary for peace, both within each of us and all around us. “…humanity has too often turned its ingenuity to destruction, even harnessing the force from which the sun draws its power. You were born into a world in which arsenals of atomic weapons have the capacity to destroy the planet dozens of times over. “War is a complete anachronism.… The time is near when your generation will have consigned war to the ash heap of history. “Humanity is entirely responsible for being at the root of the problems arising from global warming. “We need to rethink the way we live on earth in order to preserve life. Global warming is out of control…. Time is not on our side, which is why I am calling on all young millennials to hasten this radical revolution. “You are a part of nature and compassion decrees that you take care of it as much as you do yourselves. “It is only through mutual support and co-operation that you will be able to contain disasters that are fuelled by economic and social injustice and are fuelled by greed, selfishness, and other negative states of mind…. “A new day is being born. It is as though one page is turning on the horizon to the next one.… The only way forward is to bring on a Revolution of Compassion which will breathe new life into democracy by extending solidarity.... Place compassion at the heart of social life…. “The future of the world does not depend exclusively on politicians, the executive officers of huge corporations or the United Nations [but on] all those who recognize themselves as being part of ‘we’, the world’s seven billion people. “When society as a whole is imbued with a positive vision of humanity you will see contemporary power struggles transformed into a caring economy based on mutual trust and common interests. An ethics of consideration, based on the universal values of benevolence, tolerance, generosity, kindness, forgiveness, non-violence will replace the current ethics of fault finding and prohibition. Mohamad Al Jounde was the winner of the International Children’s Peace Prize in 2017, received from Malala Yousafzai. Mohamad Al Jounde was the winner of the International Children’s Peace Prize in 2017. Born in Syria, his family had to escape when his neighbourhood was bombed in the war in Syria. Mohamad and his family eventually made their way to Lebanon where they put all their efforts into making a happier place for the many children stuck in refugee camps. Mohamad was born and grew up with his family in the Syrian town of Hama. He described life as normal – his dad and mom both had jobs, they had a house, a car and Mohamad spent his time at school and with his friends. “I was born in Syria. I had a very good childhood, full of love, family and happiness. A carefree youth like every child deserves. Life was good,” Mohamad said. But Mohamad’s life changed in the spring of 2011 when Syrian pro-democracy activists, motivated by the political uprisings in Egypt and Tunisia, protested the leadership of President Bashar Al-Assad. What began as peaceful protests soon erupted into violence, and in July 2011 the country began to slide into a civil war that led to both regional and international involvement. By 2013, the fighting was getting closer and closer to Mohamad’s hometown. He recalled sitting at home with his family when suddenly they heard bombs outside. “All over the place we heard people yelling from the buildings nearby and I felt like this is what war means,” Mohamad said. Mohamad’s mother was arrested and detained twice as both his parents were active in the Revolution against the regime. One day Mohamad’s mother received a letter warning her that she could either stay and get killed or flee Syria. Mohamad said that the family knew the authorities wanted to kill his mother so they had to leave everything and disappear. But Mohamad’s parents could not find work in Lebanon and soon they had no money left. Mohamad’s father decided to seek asylum in Sweden but he had to leave his family behind. However, Mohamad never felt defeated and his situation ignited his will to fight for a better future for himself and for other children. Together with his family, Mohamad started a school for Syrian children in a refugee camp and what began in a tent became a real school building staffed with formal teachers and 200 children. The children came from the surrounding camps as well to learn at the school. The 2018 ‘crop circle’, or crop formation, season is almost over. By the end of July UK websites, Temporary Temples and Crop Circle Connector, had posted dozens of reports of formations – mainly in southern England but also in Switzerland, France, Russia and the Czech Republic. 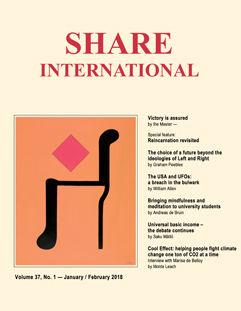 Benjamin Creme (BC) wrote many times about the phenomenon in past issues of Share International (SI) and in several books, especially The Gathering of the Forces of Light (Share International Foundation, 2010). According to BC, the majority of crop formations are created by spacecraft from neighboring planets, mainly Mars and Venus, using an extraordinarily advanced technology. The formations serve a twofold purpose: they are ‘calling cards’ of the Beings in the spacecraft, to acknowledge their presence subtly and beautifully, without infringing our freewill. The crop formations are also vortexes of energy that are being created – not just in European grain but around the world – to replicate on the physical plane the grid of the Earth’s magnetic field. This is in preparation for a new technology, the Technology of Light, that will be developed once we have ‘put our house in order’, through the implementation of Maitreya’s priorities, ensuring a stable and peaceful world. Among other advances, it will give us safe, non-polluting, free, unlimited energy for all our needs. Pope Francis, who has long been an outspoken critic of the death penalty, has officially approved changes to the catechism, the Catholic Church’s primary teaching document, which now states that “the death penalty is inadmissible because it is an attack on the inviolability and dignity of the person”. Updates to the catechism are extremely rare, so this move represents a significant step on the part of the Pope. A majority of the world’s countries – including nearly every nation in Europe and Latin America, regions with large Catholic populations – have already banned the death penalty, according to Amnesty International. The human rights group says a majority of the world’s executions take place in five countries: China, Iran, Saudi Arabia, Iraq and Pakistan. The United States was number 8 on the list in 2017…..